The temperature soared into the 40s and the sun stayed out despite a forecast of clouds. That was a sign, so Margaret and I loaded the two dogs into the back of my car; the older one I now have to pick up and place there. He can no longer just jump in. Then we drove up into the hills and the deep snow, where aside from some plowing, there are only the tracks of snowmobiles to follow. And so we did. The younger dog headed out into deep snow until you could only see her head. Sooner or later she would make it back out. The old dog knows better now, having struggled in deep snow not long ago. He stuck to the snowmobile tracks, with only occasional sorties a few feet into deeper snow. Margaret and I followed the wide snowmobile paths until we had no choice but to sink into the snow. The snow is white and deep far out into the forest. 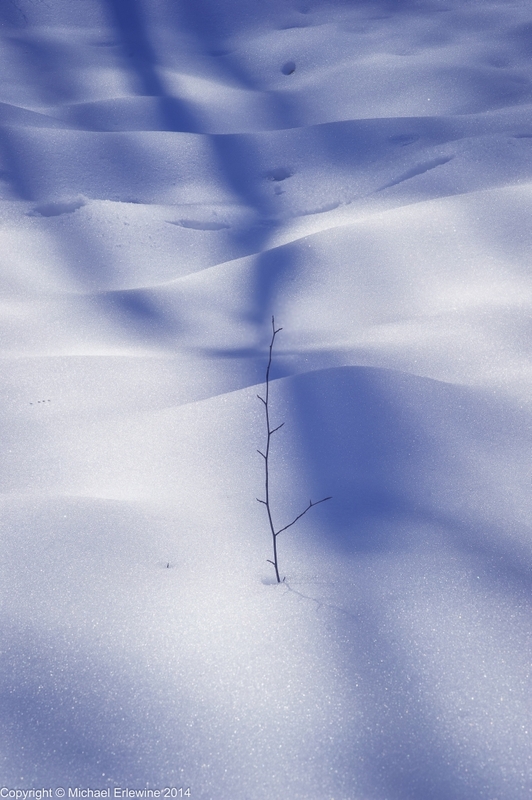 The sky is bright blue and the dark shadows of the naked trees crisscross and made lovely patterns on the untouched snow. I wish I had my camera, but I fell down a slippery hill once as it was. It is still a little too early for cameras. Snowshoes would have helped. Being outside in the crisp air, warmed by the sun was as close to spring as I have been this year, but I can at last see that spring is out there waiting for us, as I am for it.